99 Martial Arts Center AKA Open San Diego Martial Arts Competition Result! Posted on 21 September 2012. Posted in Updates, WushuComments Off on 99 Martial Arts Center AKA Open San Diego Martial Arts Competition Result! Wushu, also known as modern wushu or contemporary wushu, is both an exhibition and a full-contact sport derived from traditional Chinese Martial Arts. It was created in the People’s Republic of China after 1949, in an attempt to nationalize the practice of traditional Chinese martial arts. Most of the modern competition forms (套路 taolu) were formed from their parent arts (see list below) by government-appointed committee. In contemporary times, wushu has become a truly international sport through the International Wushu Federation (IWUF), which holds the World Wushu Championships every two years; the first World Championships were held in 1991 in Beijing. Modern wushu is composed of two disciplines: taolu (套路; forms) and sanda (散打; sparring). 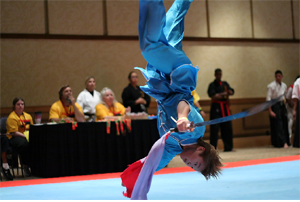 Taolu forms are similar to gymnastics and involve martial art patterns and maneuvers for which competitors are judged and given points according to specific rules. The forms comprise basic movements (stances, kicks, punches, balances, jumps, sweeps and throws) based on aggregate categories traditional Chinese martial art style and can be changed for competitions to highlight one’s strengths. Competitive forms have time limits that can range from 1 minute, 20 seconds for the some external styles to over five minutes for internal styles. 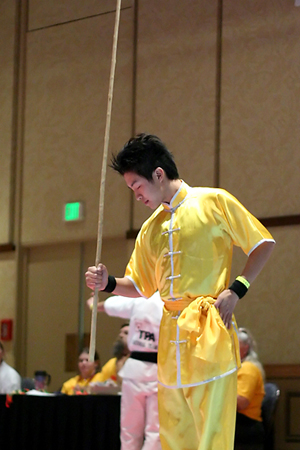 Modern wushu competitors are increasingly training in aerial techniques such as 540 and 720 degree jumps and kicks to add more difficulty and style to their forms. Literally there are hundreds of different types and styles of Wushu that still exists in China , but generally they can be divided into a few distinct branches. Geographically, Wushu can be divided into Northern Shaolin -style Wushu and Southern Shaolin -style Wushu , mainly corresponding to either the Northern Shaolin temple or the Southern Shaolin temple, although nowadays the terms cover all kinds of styles originating either from the north or the south. The main difference about these two are that the Northern styles tend to emphasize kicks, jumps and generally fluid and rapid movement, as the Southern styles focus more on strong arm and hand techniques, and stable, immovable stances and footwork. 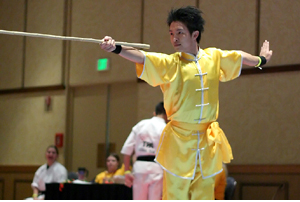 Examples of the Northern styles include Changquan and the sword and broadsword routines used in contemporary Wushu competitions, and examples of the Southern styles include Nanquan , Houquan (monkey style) and Wing Chun . In terms of methods, Wushu can be divided into either the External styles, which include most of the Wushu styles in existence, and the Internal styles, which number only a few, Taijiquan being the most famous one. External styles are more traditional fighting arts, with emphasis on strength, speed, explosive power and stamina. Internal styles focus in the precise control of movements, the balance of bodily energies and the concept of Qi (same as the Japanese Ki ) , the life energy supposedly flowing through every human being. As said above, External styles include all other types of Wushu , except for Taijiquan , Xingyiquan , Baguazhang and Liu He Ba Fa . Our instructors here are International Champions, and have more than 20+ years of experience. They have competed in countless competitions and won numerous trophies and medals. From Karate competitions to Kung Fu and Wushu competitions, they have experienced them all. Master Jack Tu, son of GrandMaster Tu Jin Sheng, is widely known for being Jackie Chan’s disciple. Chosen in the year 2008 against 270,000 other competitors around the world, he has been following and learning from Jackie Chan ever since. 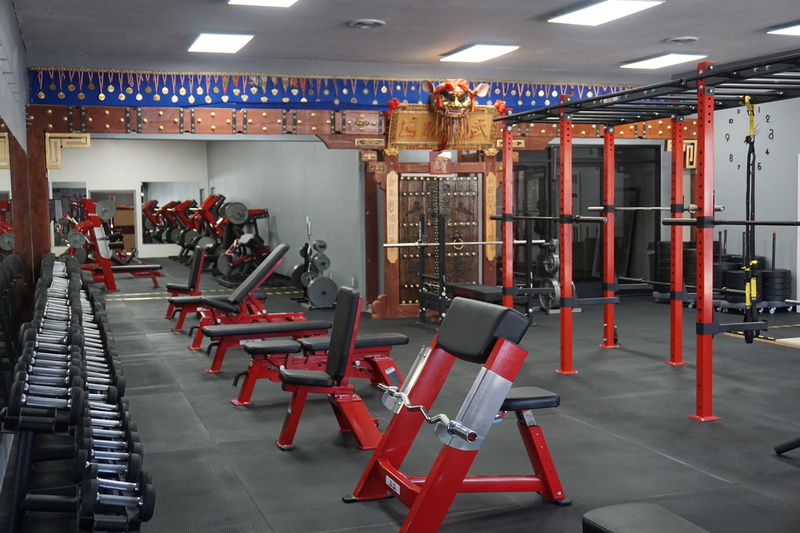 Master Jack Tu has won numerous Grand Champions in Karate competitions and as well as Kung Fu and Wushu. Master Jack Tu is currently working on films. Jenny Tu, daughter of GrandMaster Tu Jin Sheng, is the main instructor when Master Jack Tu is with Jackie Chan. 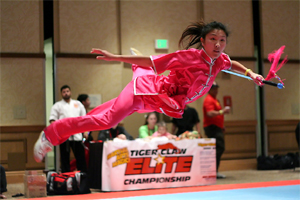 Experienced in both Karate and Kung Fu / Wushu competitions, she has won several Grand Champions. She also enjoys practicing BJJ and MMA. She is a current student of Traditional Chinese Medicine, other known as Acupuncture, and the Secretary of the Non-Profit Tao Chia Institute Organization. CMAT UC Berkeley 2009: Gold Medal Nan-Quan Advanced Women. Silver Medal Staff Advanced Women. CMAT UC Berkeley 2011 : Gold Medal Nan-Quan Advanced Women. Silver Medal Northern Staff Advanced Women. Silver Medal Broadsword Advanced Women. Jackie announces the winner of the reality television competition show, The Disciple.